The Bay of Quinte region is rich with different housing options. Some of our residents love living in our nature filled rural countryside homes and farms. Others prefer to live in our urban neighbourhoods including beautiful and trendy apartments in our downtown districts, classic multiple story homes in our historic neighbourhoods and new homes with modern amenities in our recently developed subdivisions. The average selling price of homes in the Quinte region is $240,000 with several options available above and below that average price. Interest rates in Canada are at record lows (the prime rate in October 2015 was 2.7%) and have made home buying more affordable than ever before. Buying a home in the Bay of Quinte region is 24% less expensive than the national average home price in Canada of $314,900. Several rental options are also available in Quinte. An average two bedroom apartment in Belleville or Trenton rents for $900/month plus utilities. No matter what type of home you are looking for, you will find it in the Bay of Quinte region. 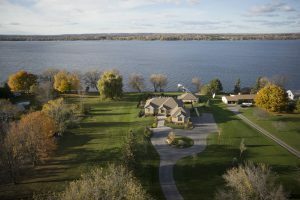 The Quinte & District Association of Realtors (http://www.quinte-mls.com/) is a great place to start the search for your new home. The real estate professionals listed on that web site can help you find the perfect home that meets your needs. The Old East Hill area in Belleville extends for several blocks east of the Downtown core along Bridge Street. There are several century homes in this neighbourhood, many which have been designated as landmarks. Many of the massive homes have been converted into duplexes and triplexes to accommodate multiple families. The area has several parks including the East Hill park and Corby Rose Garden. This large development was built in the 1990’s in Belleville’s east end and includes several bungalows and larger two-story, all-brick homes. This is another popular area for growing families and is located close to Moira Secondary School, several elementary schools and the YMCA recreation centre. Located on the western boundaries of Belleville, Potters Creek is a new home development of craftsman-inspired townhouses, bungalows and two-story homes. This quiet neighbourhood welcomes a wide-range of family sizes and buyers. It is located near Loyalist College, the Quinte Conservation Area, Centennial Secondary School and several elementary schools. The west end of Trenton has been growing over the past decade with several new home options including townhomes, bungalows and two-story homes. This neighbourhood is located closely to the newly revitalized downtown shopping district as well as the brand new Trent Port Marina. Located approximately 25 minutes north of Trenton and Belleville, the Oak Hills are a rural paradise in the Bay of Quinte region. The Trent River runs along the west part of the area which also includes a beautiful 18-hole golf course, a private airport, a small beach on Oak Lake and a conservation area. The nature views are fabulous, especially in the colourful fall season. The Village of Frankford is located just north of Trenton on the Trent River. It has new home developments on both sides of the river and is an easy drive to Trenton or Belleville. The Batawa ski hill is also located nearby for lots of outdoor fun in the winter. Rednersville Road runs along the south shore of the Bay of Quinte and stretches from Belleville to Quinte West and is home to several stunning waterfront properties. Several artists are located along Rednersville Road and host art tours in the warmer months. Campbell’s Orchards is a popular spot for freshly picked apples and family fun in the fall. Picton is the largest community in Prince Edward County and the downtown area is home to dozens of beautiful shops, the marvellous Regent Theatre and several dining options. There are heritage century homes as well as modern townhomes available in this area and all are steps away from downtown. Picton is located near the Sandbanks Provincial Park and is a popular spot for tourists, especially during the summer months. Wellington is a quaint town of around 1,700 people located on the north shore of Lake Ontario in Prince Edward County. The town has many heritage homes, including one dating as far back as 1786. There are several waterfront homes here and pretty much every home is within walking distance of Lake Ontario.